Grover Cleveland: Cougar or Kitty-Cat? He now weighs nearly six pounds and is really starting to look like a cat, rather than a hairy baked potato. It’s a good thing I’m all loved up on him, because he very quickly lost the kitten appeal. In owning a cat for six weeks, I have learned two truths: animals grow in relation to how much you feed them, and no one will call you fat if you have great gams. On the plus side, he’s really starting to grow into his name: Grover Cleveland. Grover (aka G-Man, aka Grovermeister, aka El Bad Hombre) was named after the president with the most cat-like name, save for James A. Garfield. Grover Cleveland is a tough name to live up to. Cleveland went from Mayor of Buffalo, NY in 1881 to Governor of New York in 1882 and President of the United States in 1884. He was only the second president ever elected as a bachelor, and, unfortunately, it was before the show The Bachelor, so he had to find love on his own. No one wants to walk the path of the presidency alone, and I guess Cleveland had adopted too many cats already. So he became the first (and only!) president to get married in the White House. Instead of marrying the widow, Cleveland married the widow’s daughter, Frances Folsom, a woman 28 years his junior. To give you a sense of their age gap, when Cleveland was being elected mayor of Buffalo, Folsom was dropping out of high school. But that wasn’t even the weirdest part. Cleveland had known Folsom since she was born, and was technically her legal guardian after her father died when she was 11. He was responsible for her well-being throughout her childhood, and I guess he enjoyed it so much, he wanted to keep it going all-life-long. The couple was immensely popular in Washington, and across the country. “Frank” was a trend-setting, culture-shocking, breath of fresh youthful air. Whatever she wore, everyone wore, even when she (reportedly) wore a machette bug on a gilded leash as a brooch. Basically, she was like Kate Middleton meets Lady Gaga. She set another first for the White House when the couple’s daughter, Esther, was born in one of the presidential bedrooms. Cleveland was the only president to serve non-consecutive terms. When the Cleveland’s moved out of the White House in 1888, 24-year old First Lady Frank told the staff to keep things the same — they’d be back. And they were, four years later. The couple eventually settled in a neighborhood of Washington, D.C. where Cleveland built up a menagerie for his true love. And that’s why the National Zoo is located in Washington’s Cleveland Park neighborhood. 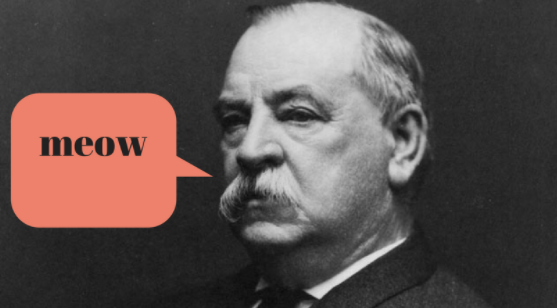 Grover Cleveland surely played an influential role in the history of the United States, but today, he is at least partially remembered for being one half of the the 1800s version of Kimye. He married his ward 28 years his junior and left a mess all over the Lincoln Bedroom. What a legacy. Before the kitten-catten Grover Cleveland decides to follow in his namesake’s footsteps, though, someone should tell him he’s already been snip-snipped. Or, actually, don’t. It’s better that he doesn’t know.